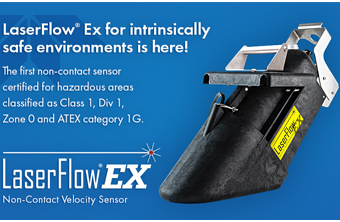 Using the patented non-Contact Laser Doppler Velocity technology and non-contact Ultrasonic Level technology, the LaserFlow Ex velocity sensor can remotely measure flow in open channels. It uses a laser beam at single or multiple points below the surface to measure the velocity. This means it can measure the velocity of the surface without contacting and disturbing the water flow. The LaserFlow Ex is suitable for a wide range of monitoring applications. Used alongside Teledyne ISCO's TIENet™ Barrier, it is compatible with the Signature Flowmeter and the 2160 LaserFlow Module. Using the specially designed mounting bracket, the LaserFlow Ex can be installed and deployed from street level, avoiding the need for for confined space entry, saving you money and time. Data can also be retrieved easily from a remote location using the extensive communication options, and the built-in diagnostics make for easy installation and maintenance. See the Datasheet or read the Brochure for more information. You can purchase the new LaserFlow Ex from us HERE.